Questions? Read on. We have compiled information about bed width, install, warranty and all the other good stuff. Don't find what you are looking for? Give us a shout, we will be happy to help! Why Flares and what are they? 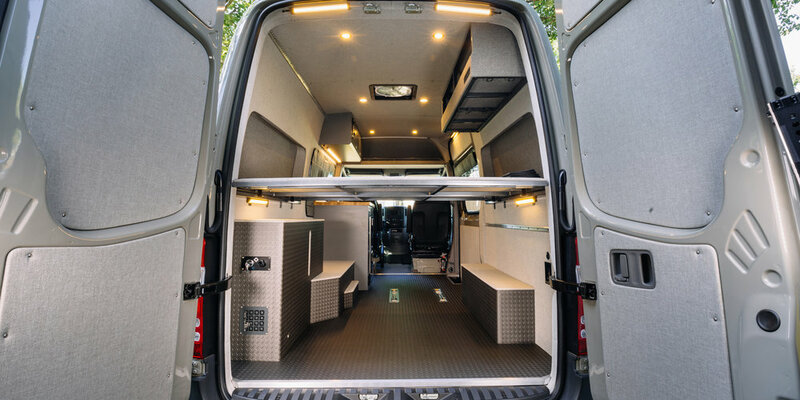 Flares are fiberglass panels that will extend the width of your van, increasing usable space and opening up new design options. The size of a bed will be flexible in width and up to 79" long. A bed can be installed 30-36" off the floor. What are the dimensions of the Flares, how much do they stick off the van? Our flares are designed to fit directly into the rear quarter panel of a van and will extend up to the window in the mid or front panel respectively. Regular depth flares will extend 3.25” off the rear quarter panel on each side, the extended driver side flare will extend 5". This sleek design does not significantly impact the view in the side view mirrors and allows for full use of the slider door(s). Rear doors can still be opened 270 degrees with the use of an extended door stopper. Note, not applicable if rear door ladder is installed. Does the slider door need to be modified? No. The slider door will open fully without modification. Regular depth flares will work on vans with dual slider doors. Will my doors still open 270 degrees? For 270-degree door opening installation of an “extended door stopper” on the rear door is required*. This part is available at your local MB of Freightliner dealership (part no. 9067600728). *Please note this will not work if you opt for a rear door ladder, the ladder will touch the flare regardless of rear door stopper. Can I install flares on a passenger Sprinter Van? Yes! Once the glass is removed from the rear quarter panel, any of our Sprinter flares can be installed. Please be sure to obtain a quote for the glass and adhesive removal from your local shop. It takes more time than just cutting an opening in the sheet metal of the van. On the driver side, the factory window fills the entire rear quarter panel and does not stop at the slider door indentation. Our flares will not cover the bottom 3 inches on the driver side as they are made to work on vans with dual slider doors. You will need to touch up the paint or apply a strip of vinyl. Do Flares work with a side ladder? Regular depth flares will extend 3.25" off the sheet metal, same depth top to bottom. Not an issue with the ladder as far as clearance is concerned. Just remember, the further back the ladder, the less space your toes have to go past the ladder tread. The extended driver side flare will also work with a ladder. Your mounting point at the bottom is forward of the wheel arch. What are Flares made of? Flarespace flares are made of poly ester resin, also known as fiberglass. Our flares are manufactured in Portland, Oregon. We work closely with Miles Fiberglass, a fiberglass and composites company with over 50 years of experience in the RV, marine and wind turbine industry. MFC produces only the highest quality materials and we are proud to partner with them! What are the Flare dimensions? 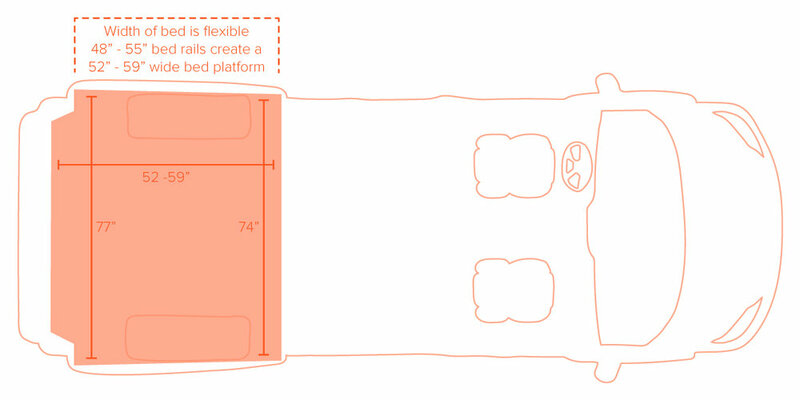 Flare dimensions vary for each type of van. For Flare dimensions specific to each van, please refer to the product page of the flare that fits your van. While Flarespace can't match the noise reduction of a finished wall with 4" depth, Flares do much better than any window or roof vent in your van with 1/4" to 3/8" of closed cell foam insulation. Can I purchase a single Flare? Flares are only sold as a driver side and passenger side set, but you can mix and match and choose a different style of flare for each side of your van. Depending on the van, choose from Solid, Window Cutout or Extended Driver Side. Where can I purchase Flares and what is included? Flares are available directly from our website, Ground shipping within the continental US is free! Your purchase will include a set of flares (driver and passenger side), approved 3M adhesive and written installation instructions. Flares are also available from our preferred installers. Flarespace offers a one-year limited warranty from date of purchase on our fiberglass flares. Please refer to our full warranty disclaimer for further information. All of our parts are made to order and we therefore do not accept returns. Flares are shipped in custom packaging to ensure safe delivery. In the event the Flares are damaged during shipping, the customer is required to wait for inspection from the shipping company as well as to take specific pictures of the damage to the part and packaging. Flare Space, LLC will not be responsible for repair or replacement of damaged Flares if an inspection doesn’t occur. Please let us know immediately if Flares sustain damage during their time with the shipping company. Do not have parts repaired or dispose of packaging until the claim resolution process is finished. Once I purchase Flares, when will I receive them? Flares are made to order and typically ship within 5 to 7 business days of placing your order. The adhesive that is shipped with your Flares has a 12-month shelf life from the date of manufacture on the adhesive. Please plan ahead and make sure to install your Flares within 12 months of that date. Expired adhesive will harden and not come out of the tube. Flares are also not meant to be stored for a long time. If you do need to store them for a few weeks, please do so after unpacking and placing each panel glue flange down on a flat surface. Does Flarespace ship to Canada, Alaska or Europe? Ground shipping within the continental US is included in the cost of a set of Flares. International customers have successfully used freight forwarding companies to ship their Flare orders outside of the US. Carlile and Vanguard both have export logistics centers in the US and will assist with account set up and customs requirements. Flarespace will ship to one of these centers.